Every museum has education collections. 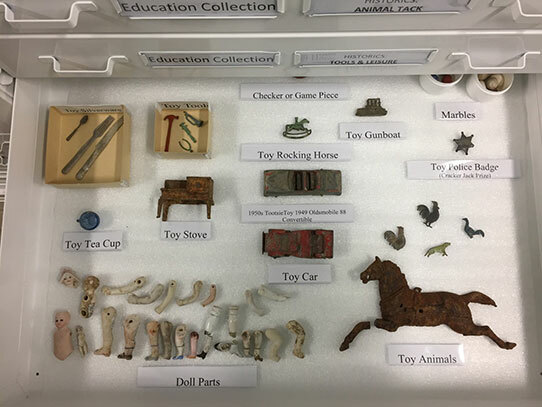 In the Archaeology and Historic Preservation Division, these are collections of artifacts that we use to teach visitors about the human past. They may be scapula gardening hoes, stone projectile points, or tiny glass beads – basically any object that can help illustrate human behavior, interaction, and innovation in the past. 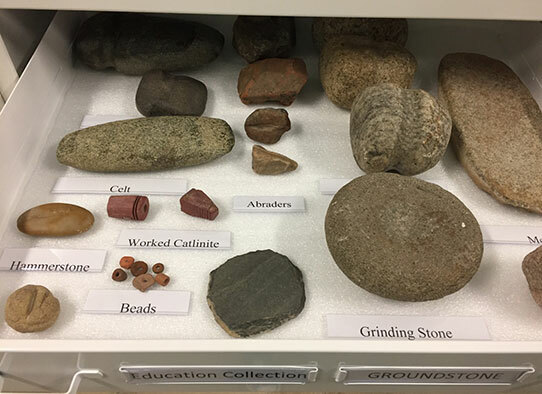 These are the collections we use in educational programs, take to local classrooms, and allow people to handle and touch. This is important because so much of archaeology is tactile – that is, the feeling of the object in your hand is part of the process of identifying and analyzing it. For instance, you might have a hard time feeling the surface treatment on a pot, the smooth finish on a groundstone, or the grinding on the base of a projectile point if you were wearing gloves. So this collection is an important part of teaching people how we make the dozens of observations that allow us to draw stories from objects. But these collections are different from our permanent, accessioned collections in one important way. They have little or no provenience. Provenience refers to where the artifact came from (both the site itself and which part of the site). Provenience information is where we learn the artifact’s context – where the artifact was found in relation to other artifacts and features on a site. And context is what lends the artifact its research value. If I found an artifact on the ground and picked it up to take it home (or even to our museum to show someone!) without recording its exact location, I have essentially erased most of that object’s scientific research potential. This is why if you ever visit an excavation, you will see half the people digging and the other half diligently taking notes on everything they are seeing in the ground. Without this information, we don’t know if (for example) the object was used at a bison kill site or a stone tool manufacturing site. An object taken from the floor of one earthlodge versus another earthlodge at the same site can tell us something about cultural identity or social interaction in a multiethnic community. A bone bead tells us a much different story coming from a Plains Village site than it does coming from a Paleoindian hunting camp. Ideally, all of our artifacts would be provenienced and become a part of our permanent collection. But for those that aren’t, we can still put them to good use as part of our education collection. For instance, a few months ago I was starting to get a little bored with the tours I was giving of our collections spaces. I talked a lot about the types of things we curate and what they can tell us about North Dakota’s past. But they are all stored in boxes—this is great for the artifacts, but not very exciting for visitors! When tour groups walk in, the sheer number of shelves and boxes can give them a good sense of the volume of the collection. But being able to visualize the content of those boxes is much more difficult. Instead of asking people to just trust me that they were full of artifacts, I wanted to show them. One of the archaeology collections storage rooms. So I started laying artifacts on a work table in that room before all of my tours. But that was inconvenient, because our staff needs to use that table frequently. That means I had to haul out the artifacts and put them back every time I gave a tour. 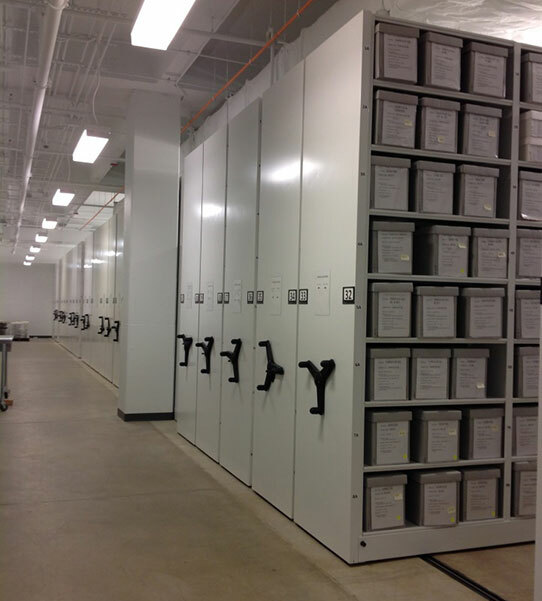 Our simple solution was to use the new storage drawers that were installed as part of our expansion. Voila! With just a couple days of selecting, arranging, and labeling, Meagan and I were able to create a handy display of the types of things that are in all those boxes. We made separate drawers for groundstone, bone tools, stone tools, pottery, modified shell, and organics. Then for historical objects, we included everything from horse tack to buttons to toys to gun parts. 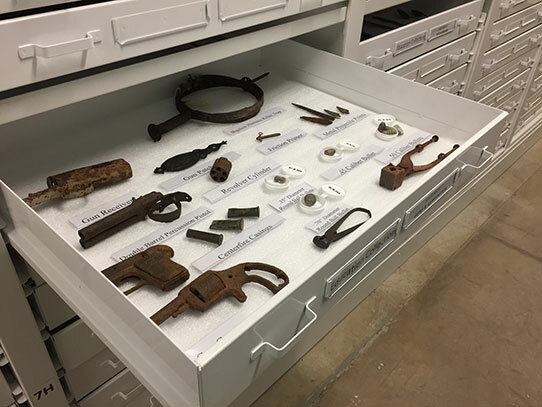 The top drawers are for visitor viewing, and the drawers below contain similar (and unprovenienced) artifacts that our staff can just grab whenever they need them for educational programs. Artifact storage drawers containing our new education collections. 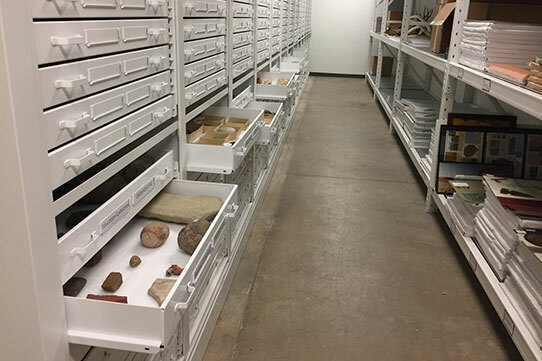 Another drawer contains all groundstone artifacts, from grooved axes to stone beads. Another drawer contains guns, gun parts, bullets, and ammunition molds. In addition to these collections, we are also putting together reference collections (made with provenienced artifacts) for researchers that range from ceramics to projectile point styles to military buttons to bullets. Would you ever guess while you are walking through the galleries that all of this work is going on right beneath your feet in the lower level of the North Dakota Heritage Center & State Museum? I highly recommend that you come and see it for yourself!